We started our tour with pickups at the hotel for those that had arrived the night before the official tour start. I had arrived early morning of the tour on a red eye, as had one other participant who was already winging their way to Canopy Tower. We arrived around mid-morning and after dropping bags, and grabbing some refreshments, we convened on the roof of the Canopy Tower to enjoy our initial views of the surrounding Soberania National Park, the Panama Canal and our first few birds of our week’s adventure. The day’s hawk flight was already underway, and our groups early arriving participant had already been treated to both Grey-headed and Swallow-tailed Kite! Though the flight was a little slow, it was a nice pace for a refresher course on raptor ID and we soon had our first Broad-winged and Swainson’s Hawks of the trip under our belt – the former enjoyed most by the West Coast contingent and the latter by those from the middle of the country and points east. Among the migrants we soon had a couple of juvenile Mississippi Kites to workshop and resident raptors put on a nice show too including such goodies as King Vulture, Zone-tailed and Short-tailed Hawk. With the flight somewhat lackadaisical we also had time to pop downstairs to check out the hummingbird feeders. Here among the throngs of Blue-chested Hummingbirds and White-vented Plumeleteers were a beautiful Long-billed Hermit as well as a less regular and stunning Violet-bellied Hummingbird. Before we knew it, lunch was upon us and so we dragged ourselves away from the birds long enough to enjoy our first hearty meal of the trip. After lunch, while awaiting the remainder of our group, we took a stroll down the entrance road to the Canopy Tower. Here we came upon our first little flocks of mixed passerines. 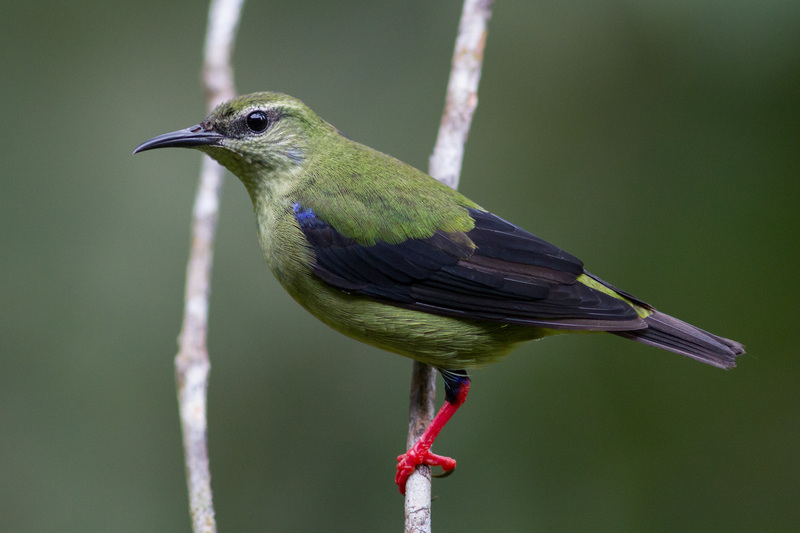 Which included a couple of Manakins: Blue-crowned and Red-capped as well as our first antbirds: Dusky Antbird and Black-crowned Antshrike. The group working well to get each other on these skulky forest birds. After that we stumbled on a productive fruiting tree which hosted several jaunty little birds including White-shouldered and Golden-crowned Tanager, Blue Dacnis and Green Honeycreeper. There were also a couple of nice migrants in the mix including Red-eyed Vireo and Chestnut-sided Warbler. While a few of the group caught a ride back up to the top of the hill with the final three arrivals from our group, those that walked were lucky enough to have a Great Tinamou stroll across our path. A Tamandua was only seen well by one of the group and a Stripe-throated Hermit only by myself so we had to hope for better views of that later in the tour. We finished our day with an introduction to the Tower from our guide to the week Carlos Bethancourt and another fine dinner of Panamanian comfort food. We met bright and early on the deck of Canopy Tower to start another day’s adventures in Panama. One of the first birds of the tour was perhaps one of the least expected, a wayward Brown Booby careening out of the mist as it headed for the Panama Canal and hopefully back out to sea. This was just the second ever sighting for Canopy Tower and the first one in eBird it appears. Early mornings at the tower can be great for forest-falcons though they are certainly much easier to hear than to see. Though we could hear both Slaty-backed and Barred, the Barred felt close enough to see and at least one or two of us thought we had the shadow of the bird pass through the forest below us. As well as the skulkers, there were nice canopy denizens to be enjoyed around the tower including Brown-capped Tyrannulet, Yellow-margined Flycatcher and Green Shrike-Vireo (a real crowd pleaser). 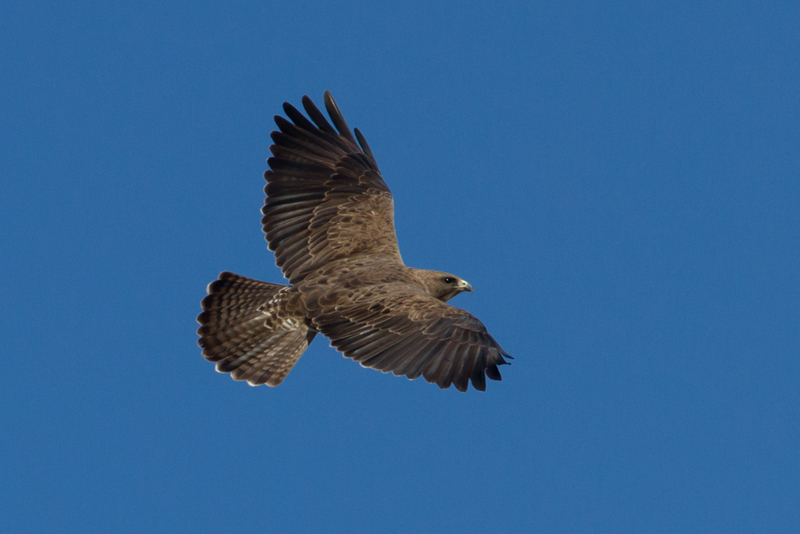 By mid-morning the migrant hawks were on the move and we had a nice little collection of local raptors up too. Highlights included a distant, but readily identifiable, White Hawk, three King Vultures and a Hook-billed Kite. As we were settling in for lunch, we realized that there was a sudden push of raptors on the move including some thousands of Swainson’s and Broad-winged Hawks as well as numbers of Turkey Vultures too. We ran to the roof to catch some of the crazy push, but with thunderstorms closing in we decided the more sensible option would be to watch from the windows of the dining room. Here we watched as hundreds of swirling raptors filled the nearby valleys trying to continue their journey before mainly succumbing to the weight of the rainstorm and dropping in to the forest around us. An incredible and memorable raptor migration spectacle to rival any I had witnessed before. With rain still coming down post lunch, Carlos decided to take us for a quick run down to the Canopy B&B in Gamboa so that we could at least watch some feeders from a protected spot. It turned out to be a fantastic idea and we soon had a nice mix of birds attending the bananas. The feeders were soon a cacophony of color including such brilliant birds as Red-legged Honeycreeper, Crimson-backed and Golden-hooded Tanagers as well as some greedy Orange-chinned Parakeets. The trees around the feeders also hosted a nice mix of birds including the rather nicely renamed Mistletoe Tyrannulet. As we wheeled out of town the weather had eased enough to allow just a quick stop at Ammo Ponds. Here among the usual waders: Rufescent Tiger-Heron, Purple Gallinule and Wattled Jacana we picked up a couple of nice additional species including Yellow-tailed Oriole, Panama Flycatcher and a host of perched swallows including nice looks at a group of Mangrove Swallows. As the gringo guide on the tour it’s always nice to be able to add something to an itinerary and today was my turn to add something a little different to last year in the shape of a visit to Finca Bayano. I’d done a little research following last years tour and this wetland complex looked promising for some open country species of birds and raptors not likely in other places. We hadn’t even arrived at El Jagua before we managed to pick up a couple of new birds for the trip. I’m not sure everyone was as thrilled as I was to get House Sparrow on the list, but they all count. More exciting admittedly though was a quick bathroom stop that yielded a few open country species, almost certainly highlighted by a dozen or so splendid Fork-tailed Flycatchers. Finca Bayano turned out to be a great spot and Carlos quickly found us a host of new birds for the tour, many ones that we were not to see at other sites. Just along the initial stretch of the entrance road we added Striped Cuckoo, and a couple of dazzling new hummingbirds: Sapphire-throated Hummingbird and Black-throated Mango. The entrance road also produced a couple of nice new raptors including a couple of White-tailed Kites, but more importantly a stunning pair of often hard to find Pearl Kites. The Pearl Kites putting on quite the show as they were engrossed in a lizard that one of them had caught. As well as the local hawks there were a bunch of migrant raptors starting to pick up from the surrounding forest: Broad-winged Hawks, Swainson’s Hawks and Turkey Vultures. As the kettles began to form local birds joined in the fun and we soon had Roadside Hawk and Lesser Yellow-headed Vulture joining the throng. The open expanses of wetlands here provided a great setting for watching migrating raptors and as we birded, so a stream of thousands of migrant raptors passed overhead. The wetlands also hosted a wealth of great water birds too. As well as a host of common egrets and herons we also added a couple of less common ones including Bare-throated Tiger-Heron and Cocoi Heron. There were interesting land birds to be found here too including jaunty little Pied Water-Tyrants and foraging Gray Kingbirds. “Rarest” of all though was a Wilson’s Snipe that we managed to pick up in flight over the wetlands, a new bird for me in Panama. This open country spot also hosted a collection of cool falcons including Crested and Yellow-headed Caracara, but most excitingly a pair of Laughing Falcons that were perched above the road on the way out. Probably the highlight of the visit though personally were the great looks we had at several Savanna Hawks. This is a large, beautifully colored raptor that is always a crowd pleaser. Not to be completely outdone though were both a Great Black Hawk and a Grey-lined Hawk that were also fairly accommodating. A great new stop with a bunch of great new birds and a host of sought-after raptors and it was only just time for lunch! We stopped in downtown which allowed us to have a nice relaxing (and airconditioned) meal, to sit out some of the heat of the day and for a few of us to satiate Starbucks withdrawal symptoms. After lunch we stopped at a bay that is adjacent to the remains of the original Panama City. The flats were covered with shorebirds and in among the thousands of peeps (both Western and Semipalmated Sandpipers) and big groups of dowitchers (almost all Short-billed) we managed to eke out a nice mix of about another dozen species of shorebird including large numbers of rather spiffy looking Southern Lapwings. Other highlights picked out on the flats included both Black and Yellow-crowned Night-Herons, our only White Ibis and a rare (but regular) Lesser Black-backed Gull. Just as I thought we were going to have to leave without one, a distinctive “Mangrove” Yellow Warbler finally put in an appearance and we picked up some Saffron Finches on a roadside verge. We started our day back in the city at Parque Natural Metropolitano. This large city park hosts several nice species that are hard to find in other parts of the canal zone and is always a great place to visit. As well as the resident species we had a nice mix of migrants and species more familiar back home including Dusky-capped, Acadian and Great-crested Flycatchers as well as a smattering of warblers: Blackburnian, Bay-breasted and Chestnut-sided. Again my luck with actually seeing Rosy Thrush-Tanager was as lousy as previous visits, but we did have incredible views of Orange-billed Sparrow that made up for it. Other highlight birds here included great views of gorgeous Crimson-crested Woodpecker, cute little Bat Falcons, garrulous but surprisingly difficult to see Black-chested Jays and the ever-adorable Lance-tailed Manakin! There were also a host of pretty butterflies and a show stealing group of Howler Monkeys as well as a poseur Agouti. After lunch we ventured out to Summit Ponds. Just a short ride from Canopy Tower, this spot turned out to be a great choice for a somewhat overcast afternoon. Upon arrival we almost immediately managed to independently find two highly prized Boat-billed Herons. Following that we started to clean up on kingfishers: first Green, then Amazon and finally great looks at the incredibly aptly named American Pygmy Kingfisher! As well as the water birds there was lots else to enjoy around the pond including nice looks at a pleasing Prothonotary Warbler, close encounters with a Lesser Kiskadee and great views of Southern Rough-winged Swallows. The swallows were both viewed in flight over the ponds and perched in snags around it, allowing us close study of both their pale rumps and rufous faces. Wandering away from the group a little I stumbled upon an active group of mixed birds taking advantage of some fruiting trees. Here an incredible mix of local species and migrants chowed down on an abundance of fruit. These included a host of common tanagers: Crimson-backed, Golden-hooded, White-shouldered as well as manakins, euphonias, vireos migrant warblers and more. 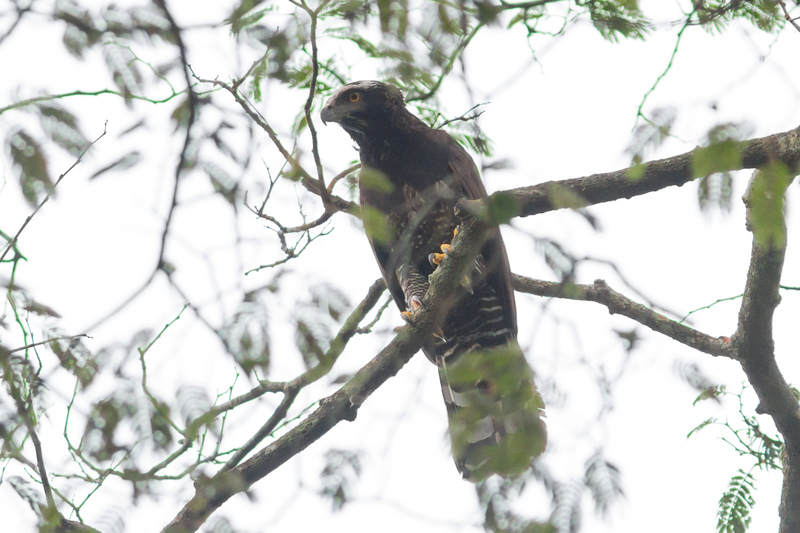 The hubbub of activity didn’t just attract my attention and we were amazed when a young Black Hawk-Eagle flew in just above us to check out the chattering flock. We were treated to amazing and extended views of this great bird before it disappeared back into the enveloping forest. Even following that amazing encounter we weren’t done. Just taking the 100-yard walk back to the van we added such delights as Scarlet-rumped Cacique, Yellow-backed Oriole and perhaps most unexpectedly a cooperative Long-billed Starthroat which sat patiently enough to allow us prolonged scope views. Another fantastic end to a wonderful day birding. We started our day venturing out towards the world-famous Pipeline Road. Though built to maintain a never activated pipeline that was constructed to allow oil transfer between The Caribbean and the Pacific during WW2, the road now acts solely as one of the most productive birding sites anywhere in the world. After crossing the sparkly new bridge to Gamboa, our first port of call was the excellent Ammo Ponds where we were (this) close to actually seeing White-throated Crake (we could see rustling rushes but not the bird). From there we made our way to the entrance of the road picking up a few nice species along the way including White-bellied Antbird, Golden-collared Manakin as well as both Pied and White-necked Puffbird (two ends of the puffbird size scale). We also stumbled upon our first little mixed flock of antbirds too, which included a personal favorite or two: Spotted Antbird and a female Dot-winged Antwren. Our journey down the road included a number of nice birds including Chestnut-headed Oropedela, Black-capped Pygmy-Tyrant and Yellow-rumped Cacique. One particular highlight was stumbling upon a mixed flock that included a hard to find Sulphur-rumped Flycatcher (about five sightings on Pipeline this year) and finding a Great Potoo perched up in a favored tree. 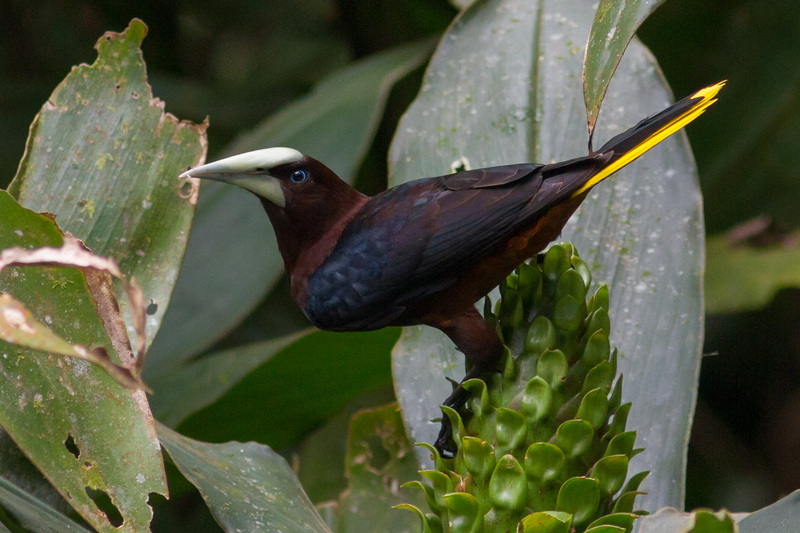 After enjoying our lunch among the hummingbirds, Song Wrens, Gray-headed Tanagers and White-faced Capuchins at Panama Rainforest Discovery Center, the group ascended the canopy tower there for some more incredible birding. Highlights here included magnificent Blue Cotingas, uncommon and desirable Moustached Antwrens and a dazzling Masked Tityra. In all we had gathered well over 100 species along the road, a memorable visit to one of the world’s premier birding spots. We spent the whole of our fifth day at Cerro Azul. This little community in the foothills east of Panama City allows one to reach some nice forests at higher elevation without traveling too far from Canopy Tower. 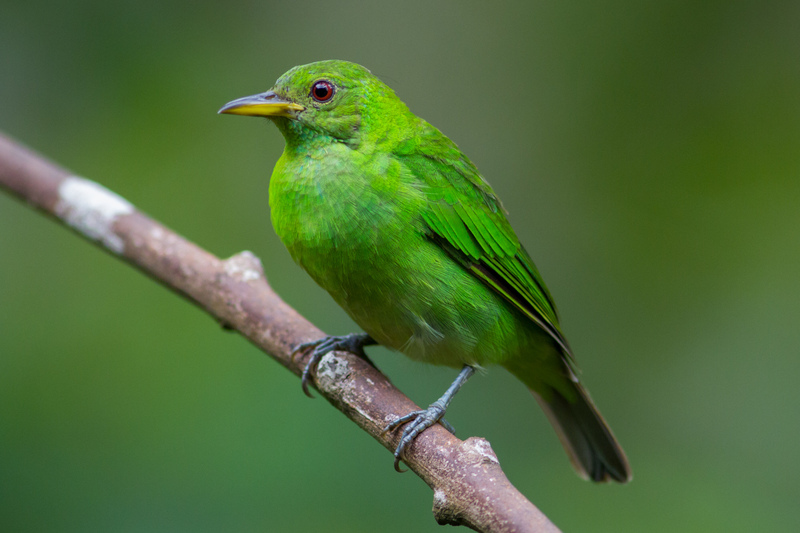 A change in elevations in the tropics generally mean a mix of different species, especially tanagers and hummingbirds. Our first stop in Cerro allowed our first encounters with jaw-dropping Bay-headed Tanager and not to be outdone a nice little group of “Black-backed” Lesser Goldfinch. Closely related to the goldfinches are euphonias and our next little pull out provided a nice little mix of them. As well as the ubiquitous Thick-billed, we also added Fulvous-vented, White-vented and Tawny-capped to our growing trip list. 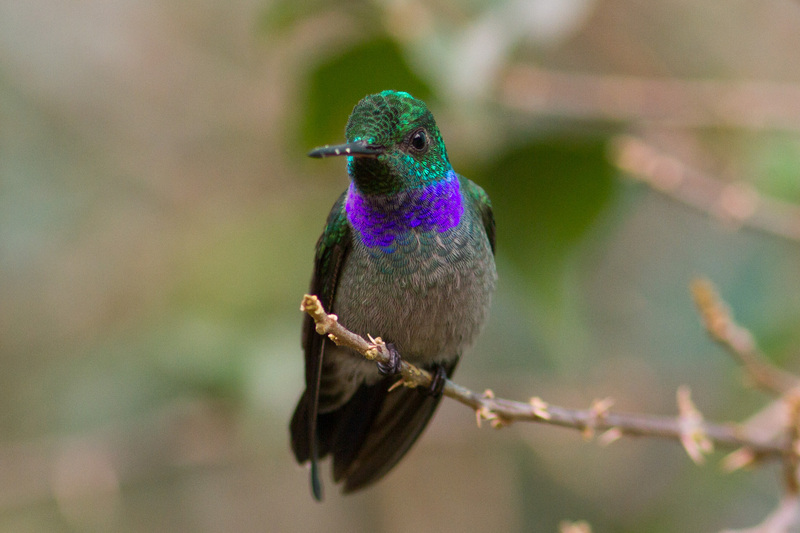 Again, everyone apart from me missed the Stripe-throated Hermit, but we were lucky enough to get views of the almost endemic Violet-capped Hummingbird. Though we were digging out a few quality species like Emerald Tanager and White-ruffed Manakin, the misty and drizzly weather was making it tough work. We therefore decided to cut our losses a little and head for an early lunch at the “Hummingbird House”. Thanks to he generosity of a couple of expats that live in town we spent our lunchtime reveling in watching a host of well attended hummingbird feeders. 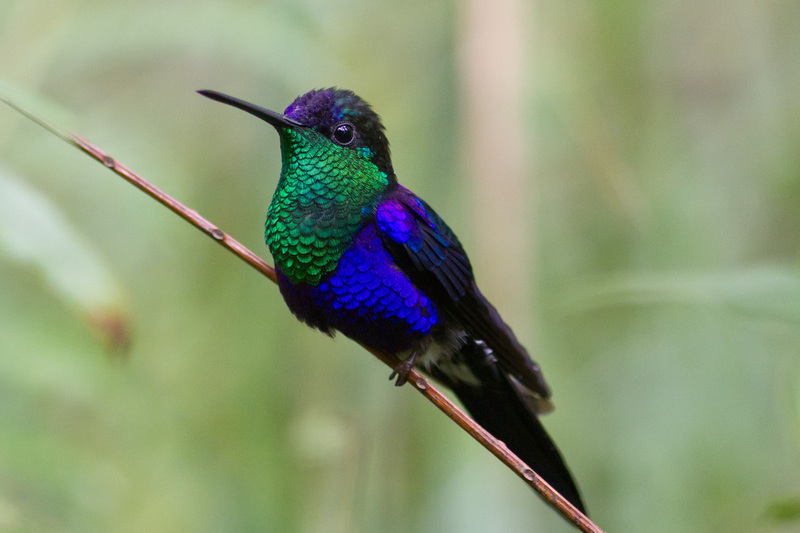 As well as species we’d already enjoyed there were both huge numbers of and a great variety of new hummingbird species, from the giant Green Hermit to the tiny Violet-bellied Hummingbird. Other hummer highlights here included Bronze-tailed Plumeleteer, Crowned Woodnymph and Snowy-bellied Hummingbird. Not to be outdone by the hummingbirds, the honeycreepers were putting on a good show with a constant tooing and froing of stunning Shining Honeycreepers as well as their Green and Red-legged brethren. Add to that mix Black-cheeked Woodpecker, Hepatic Tanager and Bananaquit and you had a variety and number of birds to keep everyone entertained. A great way to end our trip to Cerro Azul. Our last full day together started with Alex as our guide as Carlos had to attend to a couple of other things. Though the plan had been to aim for the Gamboa, I thought it worth perhaps a quick stop at Pipeline Road for a couple of species we had missed yesterday. Of course, picking up missed species is always going to be a long shot, but we were soon finding a few new species for the trip including a couple of expected species that were inexplicably missing: Rufous Motmot and Gray-headed Chachalaca. Alex was finding a number of great birds for us and the group finally all had good looks at Greater Tinamou and Stripe-throated Hermit. A couple of other seen but not heard species gave themselves up further down the road when a mixed flock yielded both Cinnamon Woodpecker and Purple-throated Fruitcrow (which were obliging enough to fly in to my whistled response). The only uncooperative bird was an uncommon Scaly-throated Leaftosser that vocalized regularly but refused to be viewed. With that nice little mix of birds at Pipeline we moved back on schedule with a stop in Gamboa along the river. Here the birding highlights came thick and fast including an incredibly cooperative Great Black Hawk and a new raptor for the trip: Snail Kite, a bird that has expanded its range rapidly in the last twenty years to exploit the introduced Large Apple Snails that have arrived in Lake Gatun and surrounding waterways. Nice little mixed groups of passerines also had us enthralled here which included new species like the stunning Flame-rumped Tanager and looks at previously unsighted birds like Barred Antshrike. Highlights of the mixed flock action though had to be a group of roving warblers and vireos which had hidden amid the mix a gorgeous Golden-winged Warbler and an eye-catching White-winged Becard. 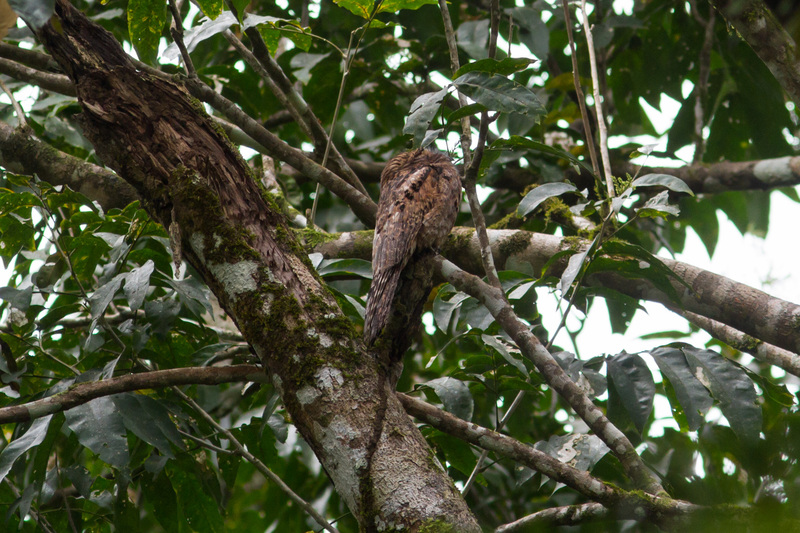 Our final treat in Gamboa was a Common Potoo posed cryptically in a known roosting spot and a loafing Capybara taking in the scenery as we headed back to the main road. A suitably superb end to fantastic mornings birding. After reconnecting with Carlos at lunchtime we traded one of the wonders of the natural world (Pipeline Road) for one of the man-made wonders of the world, The Panama Canal. The Miraflores Locks boasts a great museum covering the history of the construction of the canal and a viewing platform that boasts not just superb views of this incredible feat of engineering (including the passing boats) but also a good vantage point for observing local wildlife. Initial highlights included both birds: American Kestrel and Magnificent Frigatebird as well as mammals: Crab-eating Raccoons and White-tailed Deer. As we were waiting for a boat to arrive and pass through the locks, Carlos and I started to pick up on a huge movement of migrating raptors out over Panama City. The flight was initially distant but obviously incredibly large. As the flight continued and developed it started to drift our way and soon a significant part of the flight was directly adjacent to the locks, proving great looks at passing Swainson’s Hawks of all shades and a huge number of Broad-winged Hawks and Turkey Vultures. Mixed in among the migrants were a handful of Mississippi Kites, a Short-tailed Hawk, a Peregrine Falcon and some Ospreys. There were a few passing swallows and a Common Nighthawk too. After the incredible day of migration the year before, it was hard to believe that this year’s tour could have rivaled that great day and yet here we were again watching hundreds of thousands of passing raptors. A fittingly incredible end for a tour aimed at witnessing the unbelievable spectacle of migration through the wonderful country that is Panama. We ended our last full day together with a brilliant barbecue in the courtyard of Canopy Tower, a fun end to a memorable trip. We said our sad farewells to a few of the group who had early departures the following morning. Though a couple of people were already winging their way to the airport, most of us had enough time to enjoy a final tropical dawn chorus on the deck at Canopy Tower before the group finally had to split up, either on to new adventures in Panama or back home again. Thanks to all of the participants on this trip for joining me for the adventure and to Carlos and all the Canopy Family staff for a wonderful introduction to this amazing country. In all the group totaled 295 species of birds including 34 species of raptors (Panama Species Checklist 2018). There are a few photos from the tour on my Flickr page (here). If you’d like to join me for an amazing week enjoying the miracle of migration in Panama I’ll be running the tour again with High Lonesome BirdTours in 2019 (details on their website). I can’t wait to see what next year brings!